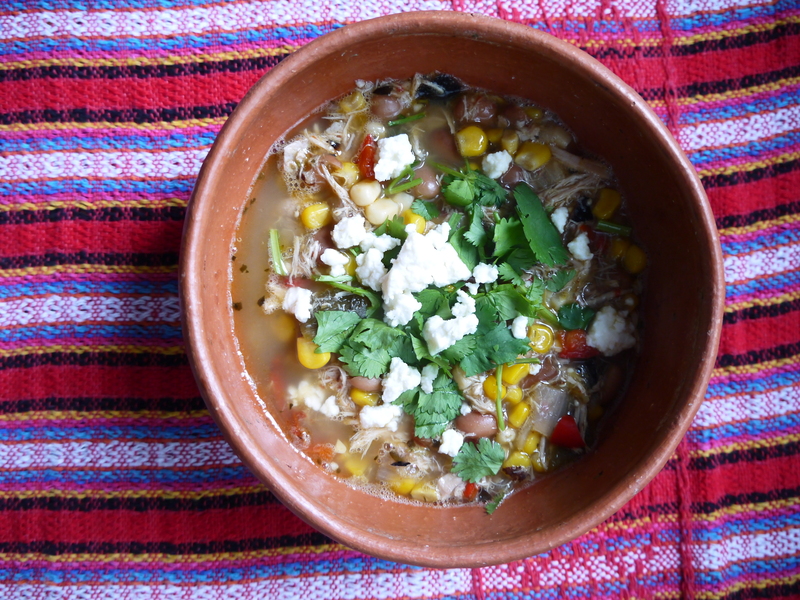 Last weekend I was planning to have friends over for dinner, and I wanted to make a pot of soup and a loaf of bread, so I made up my own version of a Mexican soup. It’s got some chicken, beans, and lots of vegetables including a few kinds of peppers. I served it with Mexican farm cheese, some cilantro, and a squirt of lime on top. Hot sauce optional. I also made a vegetarian version. This was a great recipe to make for a bunch of people, and it was enjoyed by both adults and children. I roasted the peppers and tomatillos on my gas stove but you could do this on the barbecue, or under the broiler. 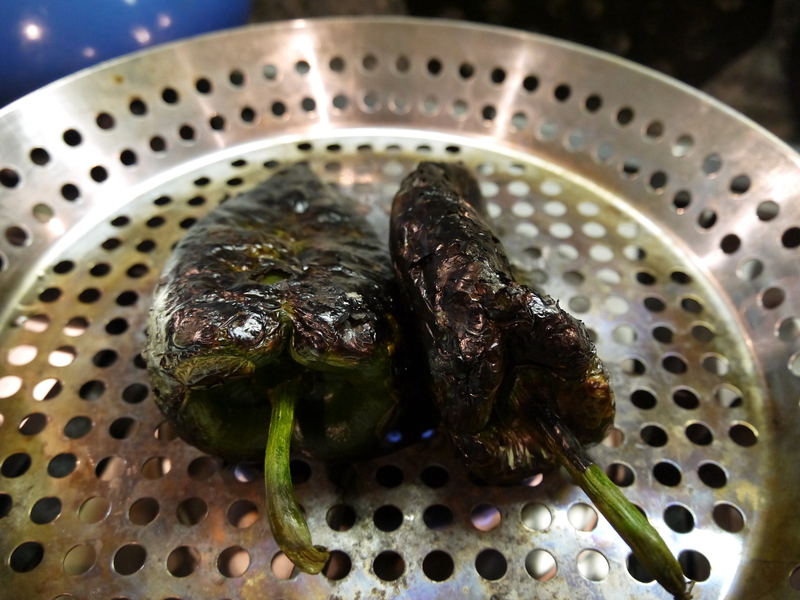 Roast the poblano and bell peppers over a flame, turning often, until the skin is blackened all over. Put the peppers into a container with a lid on it, and let them sit for about 20 minutes. Continue with the other preparations, then go back to the peppers and remove their skin and seeds. It’s okay if there are pieces of blackened skin remaining; those flecks will add character to the soup. 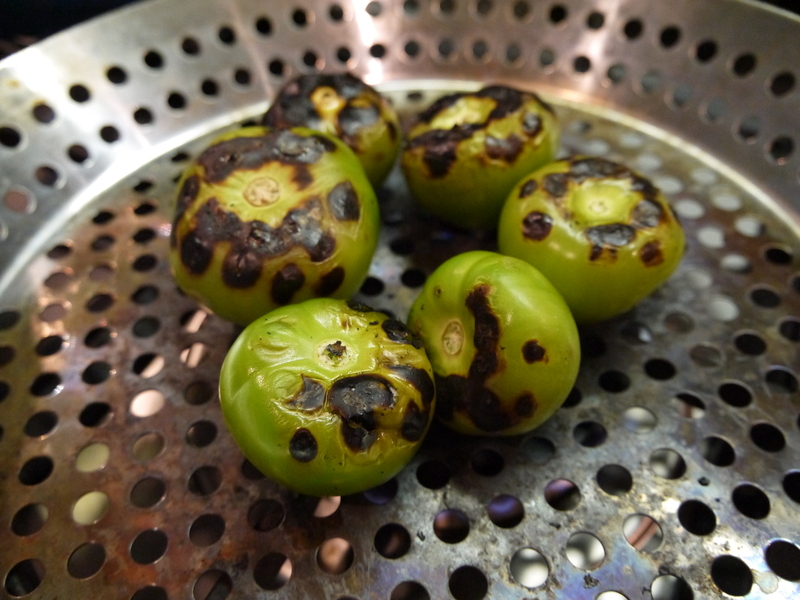 Remove the husks from the tomatillos and roast them until they are lightly blackened and only a little softened. Set them aside. In a large pot heat a little olive oil and add the diced onions. Cook for a few minutes, until they are becoming translucent, then add the garlic and cook for about a minute, stirring a bit. Add the chicken thighs and cook for a few minutes on each side. Add the chicken stock, minced serrano, and the whole guajillo pepper. Let this cook for about 20 minutes, then add the drained pinto beans. Chop the roasted peppers and tomatillos and add them to the pot. Let this cook for about 20-30 minutes. Take the chicken out and cut it into large chunks, then pull it with a fork so you’ve got stringy bits of chicken instead of cubes. Add the corn before serving and heat through, along with the juice of two limes. Add salt and pepper to taste. Serve with some chopped cilantro on top, a sprinkling of the farm cheese. Set out some hot sauce so people can add as much heat as they like.